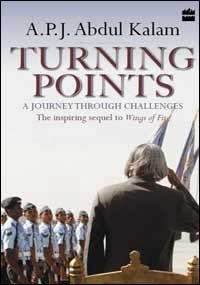 In this book, Dr. Kalam talks about his journey from 1999 to present. Dr. A. P. J. Abdul Kalam was the president of India from 2002 to 2007. He talks about the various instances that left an impression on his mind before, during and after the presidency, in this book. Dr. Kalam has always been a very popular president amongst the youth and this book provides an insight into his work and his thoughts. Throughout the book, Dr. Kalam emphasizes on the various strengths that India has and how they can be used in our development. He explained the position of the president and how that position can help our country to reach higher milestones of development. He encourages the youth to have faith and to work hard for their country. His dream of India in 2020 is often talked about in this book. While reading this book one can understand Dr. Kalam’s thoughts with great clarity. I felt a deep sense of respect for Dr. Kalam and his humble self that he has maintained throughout even after achieving so much in life. Dr Kalam is a self made man and whatever he has achieved in life is because of his own hard work. His journey is very inspiring to read and his thoughts are a food for thought for the reader. My name is Rishi Vohra and I am the author of a debut fiction, 'Once Upon the Tracks of Mumbai,' recently released in bookstores. For more information on the book, please visit www.rishivohra.com. I was wondering if you would be interested in reviewing the book on your blog. Thank you for your time and consideration. I can also be contacted back through my website.